When the idea was planted for an index that ranks the world’s leading seed companies on their efforts to make quality seeds of improved varieties available to smallholder farmers, the time frame set for achieving the UN’s Millennium Development Goals (MDGs) was coming to an end. When the MDGs were replaced by the Sustainable Development Goals (SDGs) in 2015, the first Access to Seeds Index was heading to the printer. The timing, although unplanned, could not have been better. Doubling the agricultural productivity of small-scale producers, in part through equal access to inputs, is one of the SDG targets to end hunger and achieve food security by 2030. Moreover, the UN explicitly acknowledges the role of the private sector, as a key provider of capital, jobs, technology and infrastructure, in delivering or supporting the delivery of many of these targets. When one thinks of the private sector in the context of a development agenda, it is multinationals that most often come to mind. Although the 2016 Access to Seeds Index, published in February, is not the first of its kind to examine the ways in which an industry can help solve a global challenge, it is the first to assess regional companies – initially in Eastern Africa – alongside their global peers. And the findings, which serve as a baseline against which future progress can be measured, are revealing. The Global Index assesses leading field crop and vegetable seed companies in four regions identified as having a food security challenge, smallholder farmer presence and agricultural potential. These are Latin America, Western Africa, Eastern Africa, and South and Southeast Asia. Companies are assessed on their activities in all four regions, based on the six dimensions of ‘access to seeds’ identified by stakeholders: availability, affordability, suitability, capability, profitability and autonomy. Indicators expressing what stakeholders expect from seed companies on each of these dimensions are grouped into seven measurement areas. Each measurement area is composed of indicators that assess commitment, performance, transparency and innovation. The Regional Index, meanwhile, includes multinationals and seed companies originating in the region. Both the Global and Regional Indexes seek to identify leadership and good practices, providing an evidence base for the discussion on where and how the seed industry can do more. However, it is the findings of the Regional Index that are perhaps most surprising. Behind the leading position, which is occupied by Thailand-based East-West Seed, the top of the ranking is dominated by companies originating in the region. These companies often go further than their multinational counterparts to ensure smallholders can access their products, notably in the development of innovative marketing & sales strategies. As an example, Victoria Seeds uses tuk-tuks as mobile seed shops to reach remote villages. Regional companies also outperform their global peers in the conservation and use of genetic diversity, for instance by partnering with seed banks and research institutes. On the basis of these findings, the possibility of broadening the scope of the Regional Index to South and Southeast Asia, which has the largest number of smallholder farmers but also the highest prevalence of hunger, is currently being explored. 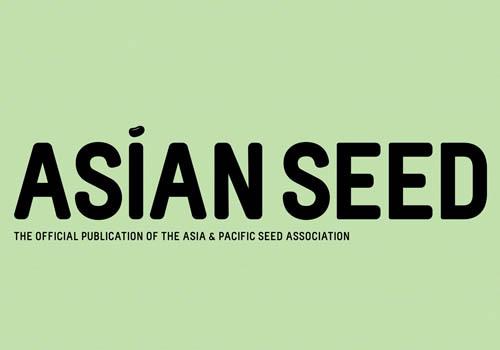 Consultations with Asian farmer organizations are underway, the results of which will be presented at the Asian Seed Congress in South Korea from November 7-11. Further dialogue with stakeholders as well as a feasibility study will inform the evaluation necessary to determine the country, company and crop scope of such an index. Initial research has already uncovered some exemplary practices by global companies. Bayer, for example, is partnering with other organizations to provide smallholder education programs and advisory services in a number of Asian countries. Other companies, such as East-West Seed, are breeding local crops tailored to smallholders’ needs. A Regional Index for Asia would likely identify further examples of what companies, both global and regional, are doing to target smallholder farmers and where there are opportunities to improve. The exploratory work being carried out for the next Index, which is scheduled for release in 2018, is taking place in parallel with a thorough review of the first Index. An independent Expert Review Committee met in June to reexamine the current methodology and discuss how this can evolve to better accommodate future iterations. Also ongoing is discussion of the Index’s findings and their implications for the role of the seed industry in advancing the SDGs. Over the year, the Access to Seeds team has attended farmers’ meetings in Africa and Asia, and spoken to industry and other stakeholders at events organized by FAO, IFPRI and the African Seed Trade Association, among others. 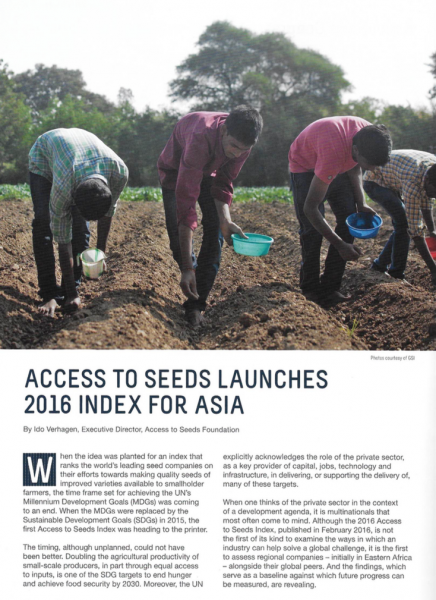 The Access to Seeds Index focuses on the private sector, but it is clear that smallholder development cannot be achieved by the seed industry alone. Market conditions are often a limiting factor. The industry, through its trade associations, could join forces with governments to create an enabling environment in which markets can flourish. At the same time, a better understanding of the industry’s current activities could help governments direct limited development resources. The Access to Seeds Index hopes to fill some of these critical information gaps. For more information about the Access to Seeds Index, including the 2016 Index Report and rankings, see www.accesstoseeds.org.